Explorer++ sorts items in the current Files pane (ie. tab) when a Refresh is done, or when refreshing is done automatically by changing the column sorting, etc. When new items are added to the tab by drag-and-drop, or by using the New item of the context (right-click) menu, newly added items are (by default) inserted in the correct location - folders at the top (or bottom, depending on the column header status), files in position by alphabetic order. Disabling this option, however, causes all new items to be placed at the bottom the of current list. This may be of benefit when editing folders, etc. and new files/folders can be determined at a glance. Of course, automatic refresh (and sorting) is still done when column sorting is changed and at startup, etc. Enabling this option causes Explorer++ to behave like an X Window application - in the Files pane only. Some users may find this more comfortable (less mouse clicks) or faster. Hover time is the time taken for the item to be selected when using single click to open an item. Hovering over a item in single click to open mode is equivilent to clicking on it in double click to open mode. This behavior is available in Windows as a system-wide setting. The General page of the Folder Options Control Panel applet provides this functionality. 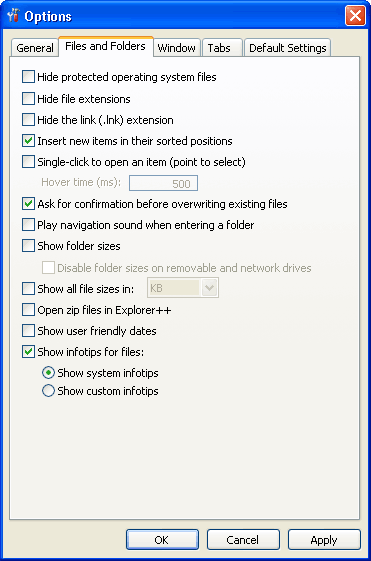 Explorer++, as it is not a native Windows component, does not obey this setting. Checking this box forces Explorer++ to calculate and display folder sizes in the Files pane. The feature might be useful if, for example, you were house-cleaning your drive and wanted to merge smaller folders with larger ones; folder sizes would be listed is the Size column, if enabled. Although it sounds obvious, when this option is enabled, Explorer++ calculates folder sizes - always. If you are walking through your folder tree to get to a particular location, large folders in the files pane will be calculated, even if they are only momentarily displayed. Windows is a multi-tasking, multi-threaded operating system; calculations continue even though the folder is no longer displayed. This may greatly impact your system’s performance - use this option with care. When folder size calculation and display is enabled, you may check this box to turn off the feature for removable and network drives, as a time-saving convenience. For network drives, this is a safety feature, as the system may not know ahead of time just how large the network drive is; time will be saved. In addition, network and removable drives are transitory - it may not be useful to know the sizes since tomorrow, the drives may not be connected. When this box is cleared, drive and file sizes (and folder sizes, if enabled) are displayed in a flexible format, that is, in bytes, kilobytes (KB - 103 bytes), megabytes (MB - 106 bytes), etc., depending on file size. Checking the box allows the user to choose from a variety of units, from bytes up to terabytes (1012 bytes) and even petabytes (1015 bytes)! File sizes will be displayed in the chosen units, even if files are small. This might prove useful in viewing the sizes of larger drives, etc. or media files (DVD files could be in the gigabyte (109 bytes) range. columns in the Files pane with user friendly dates, such as “Today, time” and ‘Yesterday, time” instead of the usual format. The usual format is determined by your system settings for Date and Time display and can be modified in the Regional and Language Options Control Panel applet. You may open the Control Panel applet here: to customize your settings (Short Date format, Time). To date, only “Today” and “Yesterday” have been implemented as user friendly dates.